I am often using svn switch to switch to a new branch, and then running dotcover to cover the code changes (unit test explorer -> Uncategorized -> Refresh -> "cover selected tests with dotcover"). However dotCover always misses to include tests introduced after the svn switch command and I start the tedious work of trying to find which tests were not run. What precautions can I take to ensure dotcover is not using any stale/cached data for determining which tests are run? (I've tried removing _Solution.ReSharper before opening solution after the svn switch but that did not help). What is the exact ReSharper version that you're using? Could you try to re-build solution after the svn switch and before refreshing unit test explorer? Is it enough I do rebuild in command prompt before opening the solution or should I do a rebuild via the vstudio ide? I will adopt this behavior after future switches and see if it resolves the issue. Thanks. It should be no difference where to do rebuild. Unfortunately that did not help. I don't know if it's because we use NUnit's SetUpFixture, unit test explorer does not seem to handle it very well (the ordering becomes very weird). Also as seen in the test session, for some reason it marks TaskFixture class as .. removed? along with 3 tests. TaskFixture class is abstract and have 2 derived types and no tests in those are run. 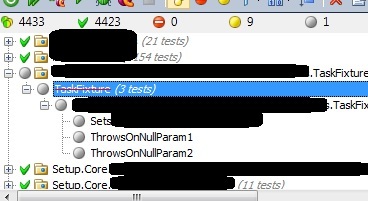 After I have opened the fixture in editor and again choose to cover all tests they are included. Seems that you have pretty old R# and dotCover release builds. First of all, could you please try to install the latest R# 7.1 and dotCover 2.2 releae builds. Let me know ASAP if it helps you. We have fixed a lot of critical bugs related to UnitTesting support both in R# and dotCover.